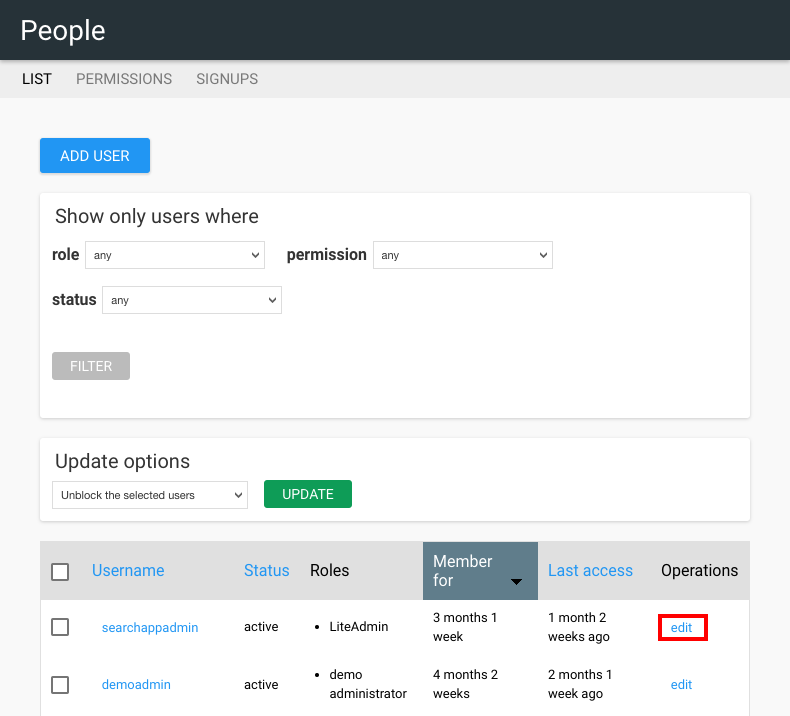 The People tile is where you assign User Roles and set up accounts for your staff. Create and manage user accounts including passwords, contact information, and automatic signups. Users may be assigned one of four staff roles: Administrator, Moderator, Editor, or Contributor. Using these roles, Stacks accommodates the needs of more experienced staff, responsible for sensitive content and controlling integrations, as well as those of more junior or volunteer staff. When creating user accounts, you must assign a role. Each role has differing account access and permissions. This is the highest permission level available within Stacks. Administrators have access to all Dashboard tools. Their responsibilities may include managing user roles, integrations, analytics, site configuration, and the look and feel of the site. They have the ability to publish and unpublish all content, regardless of author. This role would typically be assigned to a manager or staff member who is a decision maker and requires the highest level of permission. Like an Administrator, a Moderator has permission to publish or unpublish any and all content, regardless of author. They are responsible for moderating and publishing any content produced by Editors and Contributors. Unlike an Administrator, their responsibilities focus on managing content specifically. They are not responsible for managing the integrations, users, or the look and feel of the site. Moderators would likely be experienced staff, trusted with managing content, programs and events, room bookings, directories, and filter vocabularies. An Editor has permission to create any form of content, with the exception of Database Listings, Menus, Room Bookings, or Filter Vocabularies. They cannot, however, publish this content directly to the Stacks site. Instead, their created content must be approved by either a Moderator or Administrator (read more about Content Moderation). Though they may not publish content directly, they may edit existing content without requiring further moderation. An Editor role would likely be assigned to regular or part-time staff. A Contributor can create and edit their own content only. Any content they create must be moderated by a Moderator or Administrator, prior to its publication. A Contributor may only create: Events, News Articles, Pages, Custom Blocks, Research Guides, Reserves, Resource Flows, or Sliders. This role is ideal for volunteers, interns, and other specialized team members. The Event Manager role allows a staff member to log in to Stacks and access the Dashboard. A person with this role will only see the Events Management tile in the Dashboard. A person assigned this role can add events, publish events, delete events, and add and approve user signups. A staff member assigned a Bookingmanager role can login to Stacks and access the Dashboard. The Bookingmanager will only see the tiles relating to Room Booking. A person assigned this role will be able to add rooms, book rooms, and approve, decline, and delete bookings.